When we moved to Irving, Texas in the late Sixties, I learned to play very slow rhythm guitar to a very slow “Foggy Mountain Breakdown” and “The Ballad of Jed Clampett” (LISTEN) with my seventh grade friend, Brad Phillips, who was the odd combination of a banjo playing Episcopalian. Next we moved to Ohio and in high school one of my most important lifelong friends also played the banjo and we always did some Earl Scruggs songs. In college, my next door neighbor, Norman Keesee, and I had a short-lived band called “Friends and Brothers” that broke up after its only tour when we discovered that we were neither brothers nor friends with the other member of our band. We played Scruggs. In my current band, our banjo player, Greg Womble, regularly leads us in playing “Groundspeed,” one of his favorites by Earl. Earl’s tab book has been the bible of three-finger style for multiple generations of players. Last year, I realized that Earl Scruggs was to appear in Atlanta, and got tickets for Greg and me. I wanted to see the legend live before he died. We drove over to Marietta, Georgia to the Civic Center there and were treated to hearing Pat Terry open and Earl come out for the main show. We were like teenaged girls driving over, listening to his CDs, “Foggy Mountain Special,” “The Complete Mercury Sessions,” and “Live at Carnegie Hall,” while we chattered about it. 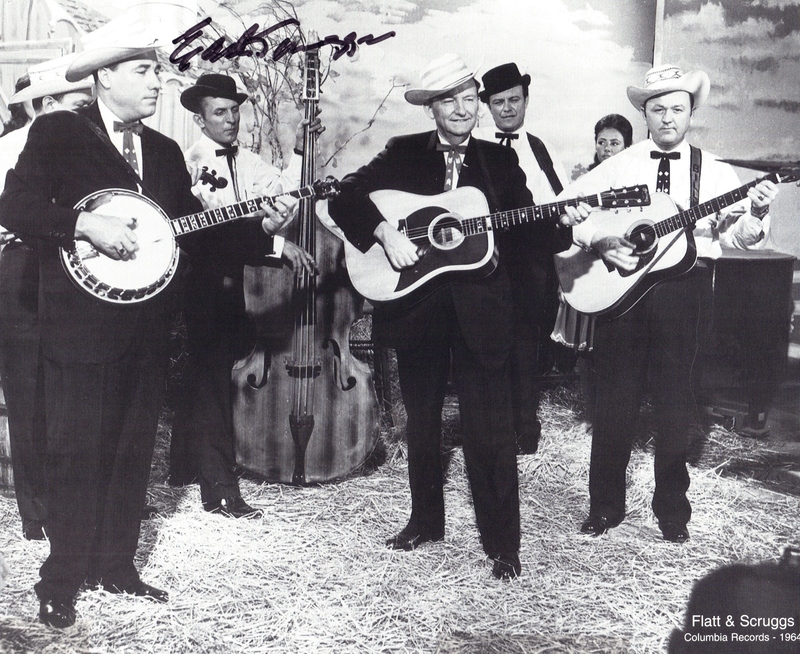 I bought a $25 black t-shirt with Earl’s face in color on it and brought a black and white picture I had bought in Nashville from 1964 of he and Lester Flatt and coaxed his sweet cousin to see if Earl might sign it for me backstage. Since I was from North Carolina, she winked at me, she’d go back at intermission and see if he’d do it. He did. He stands there in the picture, cool, steely-eyed and totally in control of the picture, waiting for the next break. The crowd that night were all devoted fans. They knew his prime was long past. His beloved Louise had already gone. He was frail. He had to be helped on the stage. It was obvious that the other players, led by his devoted sons, had to carry the force of the music, something Earl would never have done in earlier days. It didn’t matter. We all came to pay homage. And whenever he played we applauded wildly. 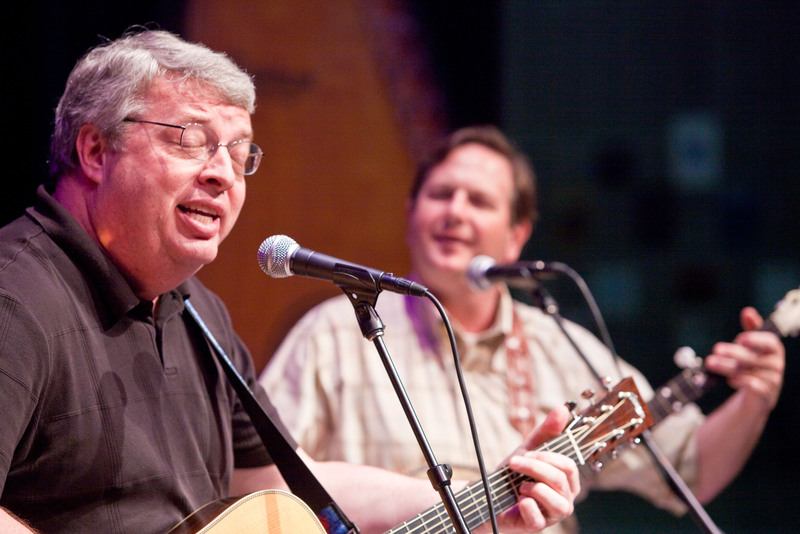 Bluegrass fans love and respect their ancestors. In his prime, Earl’s playing was a volcano on a musical island. He popularized the banjo in a way that few people ever change an instrument in their lives. Most banjo players on the earth play Earl Scruggs music. When Steve Martin returned to musical performing a few years back, he made a wildly popular music video of Scruggs’ “Foggy Mountain Breakdown,” (LISTEN) filled with legendary player offering their tributes to their master. It was pure Earl “guy music,” finger-blurring, testosterone-flying, hard charging, foot-stompin’, “go get your girl and dance” music. It’s a rush. do a few songs here and there with us together. We sang, “Sitting On Top of the World,” “I’ll Fly Away,” and “Groundspeed” (LISTEN) by Earl Scruggs. The room was full, happy, people singing, tapping feet, clapping, laughing. Earl would have loved it. When I am 88, if somebody hums a song I wrote and smiles, the labor over it would have been a gift from God to me. Music can do that. Earl Scruggs was privileged to spend his life infusing joy and a little respite from the hard things of life with only five strings with which to do it. A legend is gone. Rest in peace, Earl Scruggs. The thought of you, Bill Monroe and Lester maybe getting together again is pretty exciting. Posted on March 29, 2012, in Art, Banjo, Bluegrass, Country Music, Creativity, Earl Scruggs, Music, Old-time music and tagged Ballad of Jed Clampett, banjo, Bonnie and Clyde, Don Reno, Earl Scruggs, Flatt and Scruggs, foggy mountain breakdown, Groundspeed, J. D. Crowe, Louise Scruggs, Ralph Stanley, Steve Martin, The Ballad of Jed Clampett. Bookmark the permalink. Comments Off on Farewell, Earl Scruggs, and Thank You.